This recipe is used by most families in Bermuda and is served as a brunch or late breakfast on Sundays. I used to go to my old friend Eugene Harvey (now in Washington) house where his mother cooked for about 20 children and aunts and uncles and cousins. Their house overlooked the Sound, clear blue waters. They were an interesting family, originating in Guyana but in Bermuda for years. All very bright children, a big old house with lots of land, kept bees and planted, nice old fashioned family with good values). This dish sounds odd, but the combination of flavors is stunning. Take a frying pan and cook the onions and garlic slowly until soft and transparent. Add tinned tomatos chopped or rough blend and the sliced green pepper and cook covered on low heat for 15 minutes or so. Then add flaked fish and salt and pepper to taste. 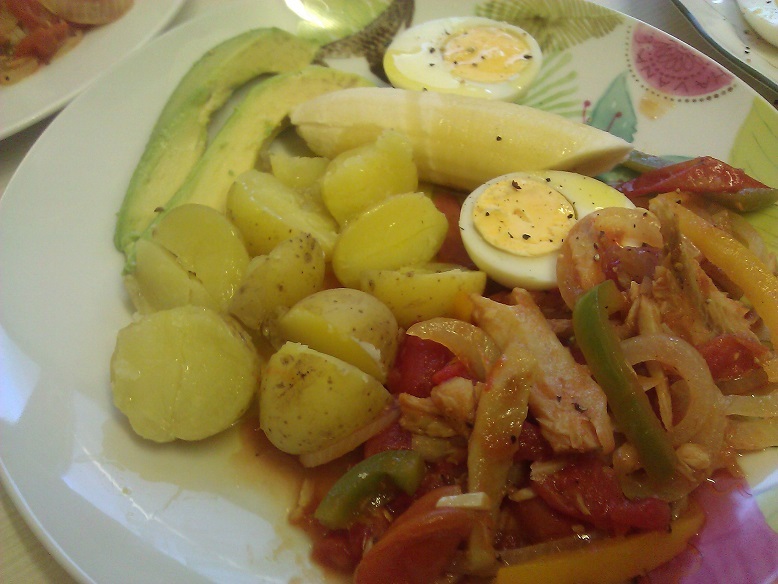 Put potato, sliced banana, slice of avocado, and halved egg on plate and spoon fish and tomato mixture on side. I have done some research and I suspect that Bermuda breakfast is a derivation of ackee and saltfish. See picture of this from Jamaica tourist site and note the similarity. The eggs in the Bermuda dish replace the ackee yellowness. The ripe banana replaces the boiled green (as green not available in Bermuda easily). Interestingly some Bermidians chop the egg up and sprinkle it over the saltfish mix. Mmmm reminds me of saltfish and bake. These recipes have been gathered over many years and I am still learning every day. Please feel free to post recipes on the site for me to try and I will comment and attribute.